I have received confirmation on giant bones from tv-channel! Breaktrough: TV-report shows the giant bones of Borjomi! 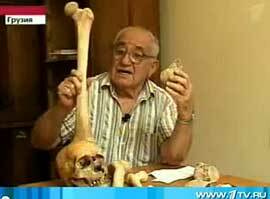 Prof. Vekua holding the giant bones! 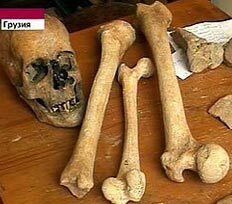 Channel One, the major broadcasting company in Russia, had a long news-report showing how a team of researchers found the giants bones of Borjomi in Georgia. The person in the report showing the bones and telling that they belonged to a giant is a renown archaeologist! I have earlier received confirmation that the news item had been sent to a internet-magazine from the Rustavi2 tv-channel but finally I also managed to get in touch with Russian Channel One and they sent my the url to the news-report on the net. So now you can see the news-report about the giants bones for yourself and read the transcription of what was said! It is just sensational! To see the new-report on the Russian Channel 1 - click here! Scientists have found a settlement after mysterious, mythical creatures in the Borjomi gorge. - Archaeologists have made a sensational find. In the mountains of the Borjomi Gorge, they found the remains of the mysterious creatures of which legends have been told for centuries by local residents. As it turned out; the stories about the huge giants are in fact reality. What a mystery that has been hidden the highlands! The bones belong to humans, the giants. They lived 25 thousand years ago in the mountains of the Borjomi Gorge. The scientists are telling that the hight of these human giants could have been from 2.5 to 3 meters. Academic Abesalom Vekua believes that the find may be a sensation, as in the scientific community long has debated if there were giants who inhabited certain areas of Eurasia thousands of years ago. "Pay attention to the lumbar bone, it differs from the bones of modern man in size and thickness. The skull is also much larger. These people have lived and evolved in isolation from the rest of civilization, they are so different in features and growth. In the literature they referred to as giants, but evidence supporting this hypothesis does not exist. Thus, we are on the threshold of a sensation. But a confirmation will have to be preceded by hard work." The legend of the giants in the highlands of the Borjomi Gorge has been passed on from generation to generation. Local shepherds and hunters claim that their ancestors spoke of superstrong giant who lived long ago in these mountains. "My grandfather told me about these strange creatures that lived here before. He, too, was probably told about this by someone. In the mountains you will find harsh conditions and untouched nature, and this is probably why only a superman could survive in those days." A group of 15 people, which included archaeologists, palaeontologists and historians, left the hunting lodge and went on an expedition to the mountains. How far they needed to go to get to the "valley of the giants," no one could tell. Waiting ahead of them were for steep, icy mountain streams and a forest predators. The only female member of the expedition was Lela Ninua a journalist from the "Good Morning" show at "Rustavi-2" tv-channel of Georgia, and she remembers the week away from civilization as an extreme game of survival. "We had to find food ourselves; we could not bring with us all we needed. It was basically to fish in the mountain streams. Collect mushrooms. At night, somebody in the group was on duty, so that bears and wolves could not sneak up on us. Once I fell behind and got lost. You can not imagine how bitterly I wept. The bones of giant people aged over 25,000 years were found in the mountains of the Borjomi Gorge (South Georgia). This is a sensational discovery, academician of the Georgian Science Academy Abessalom Vekua told media. He said that giant human remains were found. "This topic has been discussed in scientific circles for a long time," scholar said. Vekua said that these people lived in isolation from other civilizations. "They are mentioned as giants in the scientific literature, although this hypothesis was not confirmed," scholar said. I found after a half an hour, but it seemed like an eternity. " The enthusiasm of the members of the expedition was rewarded. The place of the giants - they found it. The settlement of the strange creatures had stone paths and crumbling crypts. The area was dotted with the bones. They were brought to the surface by mountain streams, which are overflowing in the spring during snowmelt. "What we found exceeded all expectations. Unfortunately, we were on primary research and could only take with us what was on the surface. What can be found in these fossilized volcanic rocks will have to be examined during an new expedition. There are a lot of interesting things. " This uninhabited mountain gorge in Borjomi can now be turned into a paradise for scientists. Now that it is known that this is the valley of the giants - that this is not a myth. The next expedition, larger and better equipped, will travel here already next summer. Meanwhile, Georgian scientists together with their foreign colleagues, will study in detail the unique material which they were able to detect. Prof. Dr. Abesalom Vekua is a leading scientific researcher of the Georgian National Museum. He is famous for finding human fossils dated at 1.8 million years old in Dmanisi, Georgia. He has published many report on his findings in Georgia, and is a recognized capacity. Subject: RE: News item on about Borjomi giant. You can find this news item on the official website http://www.1tv.ru/news/world/29635. Please, contact News Department for other information: dip@1tv.ru. Subject: News item on about Borjomi giant. ("Valley of the Giants in the Borjomi Gorge").Can you please confirm that it has been published on your tv-channel - and that it is about giant human bones found in Borjomi (I do not understand Russian)? Do you have any e-mail addresses to the researcher(s) who examined the bones? Do you know where the bones are now? I will be grateful for any reply! Do you have other information?